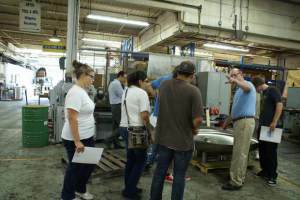 A Hands on Approach: TMA and a Growing Job Market - Meyer Tool & Mfg. 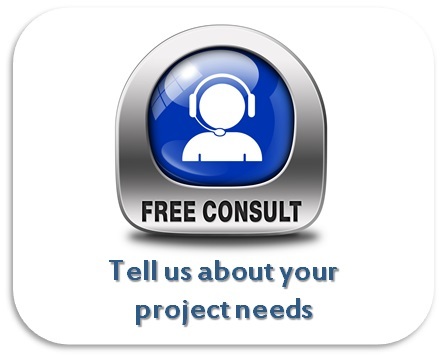 There is a growing market for the technically minded individual, the individual that lacks the desire to work at a desk all day but enjoys the idea of helping to create or build something. Although not a well-known career path in a society that largely promotes their children’s aspirations of becoming a doctor, a lawyer, or a businessperson, there is a strong and increasing market for technical skills. 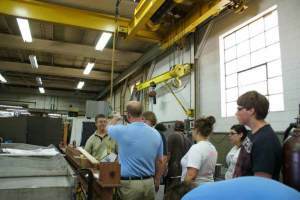 The Tooling & Manufacturing Association (TMA) works to promote the awareness of high school students to this growing alternative career path. 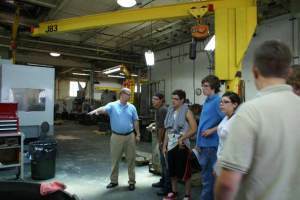 In their efforts to increase interest in manufacturing industries, TMA holds a summer camp for high school students that gives participants a working knowledge of the manufacturing industry, as well as the opportunity to tour machine and fabrication shops throughout the Chicagoland area. 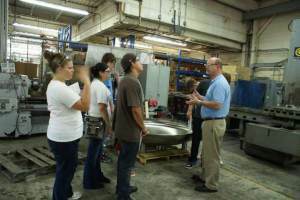 A job in manufacturing – welding, production, and machining – are not jobs commonly promoted in high schools as future career paths; however, upon talking to the students who came to Meyer Tool to tour our facilities, it is clear that many have found this path enticing all on their own. 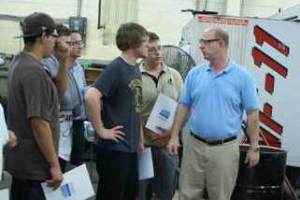 Ed Bonnema, Vice President of Meyer Tool, stood in front of the small group of high schoolers and asked them why they had come on the TMA group’s tour today. Some responded they were here because they thought it would be interesting or look good on a college application, another responded that he did not know why he chose to come, his parents had made him, but one student very clearly asserted his desire to pursue a career in precision metal working, stating that like Meyer Tool’s founder, Frank J. Meyer, he too would eventually like to open up his own manufacturing business. It became clear that other students, less outspoken as Zach, but just as focused, also desired to pursue a technical career path. Jasmine, a high school junior, realized that she “wanted a ‘hands on job’” while working in “auto shop,” a class offered by her high school. She discussed how she wanted to “research a career that had more interactive features,” which is why she attended the TMA summer camp. This statement struck a chord because most of the other students nodded and came to a consensus that Jasmine’s desire to research a career that allowed her to be hands on is why they had attended the camp as well. 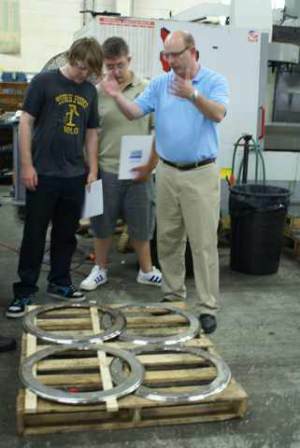 While touring the shop many of the students lingered at the welding stations, watching the welders work, and eyeing the partly assembled projects Meyer Tool was working on as Ed explained what they were intended for. 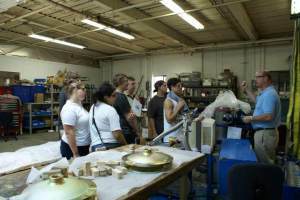 Many students marveled at their size or what the parts would ultimately be included in. 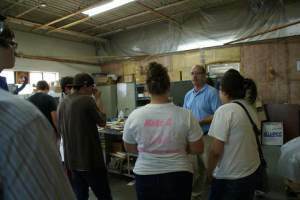 Despite it being a sweltering day, one of the hottest of the summer, the students, although sweaty, definitely seemed more interested in the shop, the work taking place, and the projects being built, than the heat. 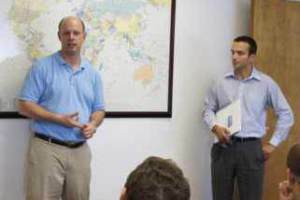 Upon the tour’s conclusion, Eileen and Ed spoke to the group again, gleaning their opinions of the shop, their interest in a technical career path, and their current aspirations. Hearing that their visit confirmed their interest in a technically oriented career, Eileen Cunningham reiterated the importance of the pursuit of technical jobs. 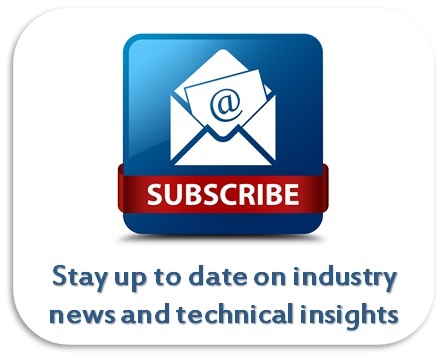 ​TMA is dedicated to giving students valuable knowledge of the technical and manufacturing industry. Founded in 1925 by a handful of small manufacturing companies who sought to improve their own businesses by coming together in an effort to achieve a common goal, the Tooling & Manufacturing Association (TMA) enabled members to improve and grow their businesses. Today, these businesses are still growing and offering potential jobs in an America that is currently struggling with a high unemployment rate and bleak outlook on employment growth in the coming years. 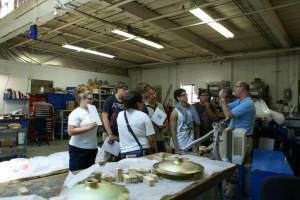 The student tour of Meyer Tool indicated that there is not only a budding interest in manufacturing and technology by students gearing up to enter the work force, but that the difficulties of the job search and the striking awareness that there are very few jobs to be had weighs just as heavily on students nearing the end of their high school careers, as it does on college graduates currently scouring the internet and career fairs for jobs. 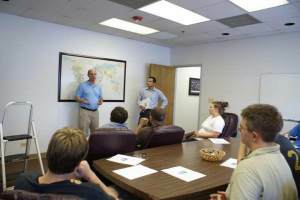 ​The “real world” has all sorts of jobs, but far fewer ones offering employment. For students like Zach and Jasmine, the desk life is not for them and their desire to find a fulfilling career that will allow them “hands on” work experience can be found in the growing technical and manufacturing industry. It is in this high tech industry that “job security” can be trusted implicitly, as America continues its pursuit of scientific and industrial advances, and the threat of outsourcing such valuable jobs and information, to other countries or companies remains a giant deterrent.